Why Choose an Inflatable Lounger? There are many situations in which you may desire seating that does not exist. Or perhaps there is seating available, such as beach chairs, but the seating fills up quickly. In cases like that, you want to have an option to ensure your comfort. Why? Because there is no reason to struggle when you can have an inflatable chair up and ready in just a minute or two. 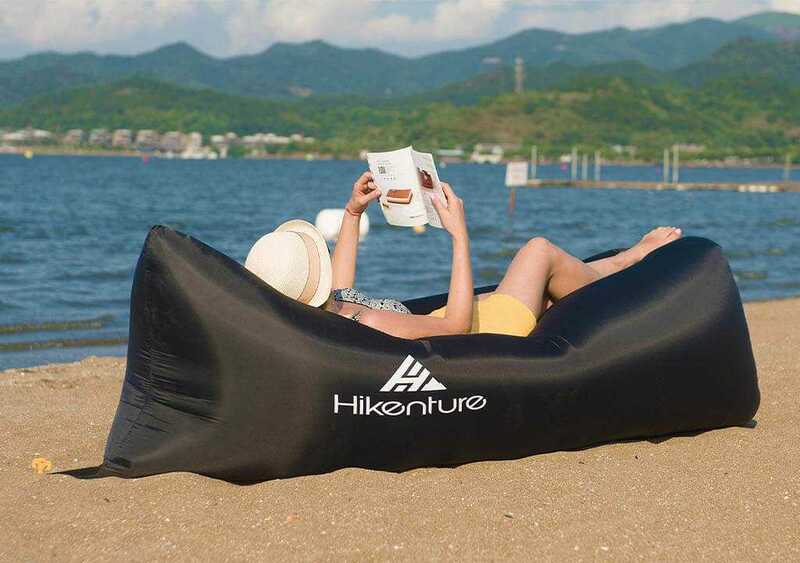 With inflatable loungers, all you need to do is hold the lounger up and fill it up with air. If it’s windy then you’re really in luck because it will fill by itself in a matter of seconds! On a day with less wind, it’s still easy to inflate. All you need to do is swing the lounger in one direction to fill it with air. Or you can run a short distance with it, if you prefer. No need to carry and fidget with any air pumps! Multi-purpose Chair If you choose to use an inflatable lounger, you will find extra value. Using it as a comfortable recliner for the beach or your camping site is a given that you will be happy with. But you will also be able to use your lounger as a water float!Your comfort on land and in the water can be taken care of by this one inflatable lounger. It will create a really flexible experience for you and expand the potential for fun! Practical Functionality One of the best parts about standard canvas camping chairs is that they usually have cup holders on the arms. But let’s face it, while this is helpful, it’s also a bit limiting. Not much can fit in those cup holders. Inflatable air loungers are ahead of the game with this function. Many inflatable couches come with pockets on both sides. These pockets are created to provide flexibility in what you’d like to keep in them. You can keep your drinks, sunglasses, books, and any other smaller items that you can think of in these pockets. These pockets are a great feature that really add to the functional and practical value of inflatable loungers. Various Colors and Patterns One of the funnest perks of having an inflatable lounger is that they are available in a large variety of colors and patterns. You don’t need to settle for a muted or undesirable color. You will have the opportunity to express yourself through the color and pattern of your blow up chair. The people around you might just ask to join in on your fun! PersonCare Luxury Inflatable Lounger Sleeping Bag Sofa It's always nice to lounge around by the pool or on the beach on something comfortable. Many of us brings our lounge chairs, gravity chairs and even a blanket when chilling on the beach or by the pool. This unique product, shown here, is totally different. I will admit...I've never seen anything like this until a video popped up on Facebook. I thought..."how neat!". The video made it seemed so easy to air up, without any air compression or special equipment. I knew I had to have one of these! The PersonCare Luxury Inflatable Lounger Sleeping Sofa Bed is perfect for the beach, park, swimming, BBQ get-togethers or any outdoor activities. Just hold the bag, open end against the air for 10 seconds and the bag is said to inflate. There are two openings...it's best to fill one opening up with air, close that end and then fill the other end. Once slightly filled with air, you then roll the bag until fully inflated and secure it with the attached clips. I will tell you, if you over inflate, before securing the bag, the ends that are secured, will more than likely come undone once you sit on the bag. This is because too much air is inside and it has no choice but to come undone or deflate when a lot of pressure is applied to the bag. Overall...I love this bag. At first, it did take some work getting the bag filled up, the I love how big, comfy and unique this lounger is. It's almost like having your own sofa bed with you on the beach or backyard!